Today's Ensign is being put together for the first time using the fifth version of Apple MacIntosh's system ten software, name Leopard. This system 10.5 was released on October 27 and I had ordered it the day before and it arrived last week and yesterday it was time to install the new system. I am explaining this because many of you who read this are Microsoft Windows users and few Windows computers are ever upgraded from one system to another. Most people buy their computer with whatever system is on it and stay with it until they buy another. That is not the case in the Macintosh world where new systems come out regularly and almost everyone converts over to the new system as soon as it becomes available. In case of the last system, Tiger, the transistion was very straightforward just as it had been with the system before that. The Mac OS had made a major change from its earlier configuration systems 8 and 9 almost a decade ago and since then we have been used the OS X systems which are a variation of UNIX deep down at the core of the system. The advantage of these systems has been stability and security. This new system 10.5 is the most radical version since the move to OS X in the first place. The new features in this operating system will take some getting used to and having only used it for a day it would be premature for me to give you much of a review of it at this time. But I should mention that it has built into it a continuous back up system that allows you to head back in time to any point in any application and see what things or documents were like at that moment. The feature is called "Time Machine" and is going change the way we do things with computers but it does not come without a price. My machine has close to a terrabyte of hard drive space and I assumed I would just set one drive aside for the TimeMachine work. Looks like it will not work as 236GB is simply not enough to do the job for this system and I will need a wicked one Terrabyte or close to it drive to do the task. As with all of the Mac OS upgrades the new system has loads of additional features but is enhanced in its performance and it is clear that speed and efficiency have once again been improved. As with all things it will take some getting used to and may even require some hardware adjustments as I have had an issue with my multiple screen system and am having to make do with three today when I usually have four to work on. 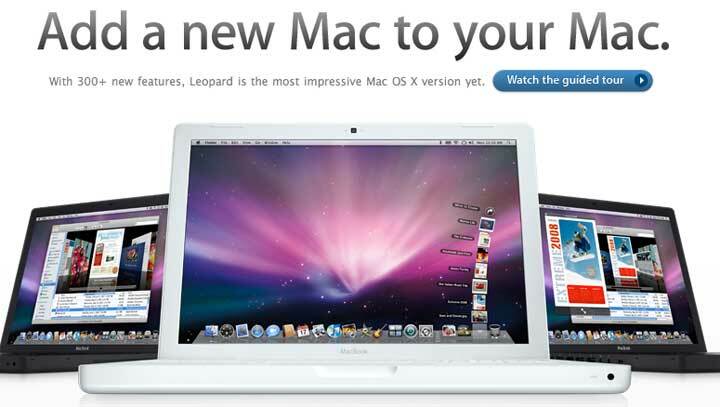 If you are a Mac user and you are wondering about the various feastures and if you should move to Leopard be sure to get in touch with me and I will try to put together a comprehensive assessment of the system in a month or so.